On Kevin Can Wait Season 2 Episode 8, Kevin and Vanessa joined forces to find out whether they were about to be sued when someone had a fall at the office. On Kevin Can Wait Season 2 Episode 7, Kevin and Vanessa tried to land a new security gig at a toy store, but what went wrong for them? 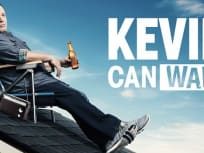 On Kevin Can Wait Season 2 Episode 6, Kevin and Chale set out on a road trip to retrieve Kendra's owl, but did they make it back with it? On Kevin Can Wait Season 2 Episode 5, Vanessa plotted her revenge after learning Kevin lied to watch football. On Kevin Can Wait Season 2 Episode 4, Kevin pretends to be Vanessa's "successful doctor" date at her sister's wedding to impress her very judgmental father. On Kevin Can Wait Season 2 Episode 3, Vanessa suggested Sara had a new boyfriend and Kevin went to extreme measures to find out the truth. On Kevin Can Wait Season 2 Episode 2, Kevin found himself working on a brand new job after his daughter pushes him into it. On Kevin Can Wait Season 2 Episode 1, Kevin rushes to throw the perfect wedding party for Kendra, but does he get everything right?